One day a few weeks ago my son was at it again. And you know what I said? He was expecting to watch something on Netflix. 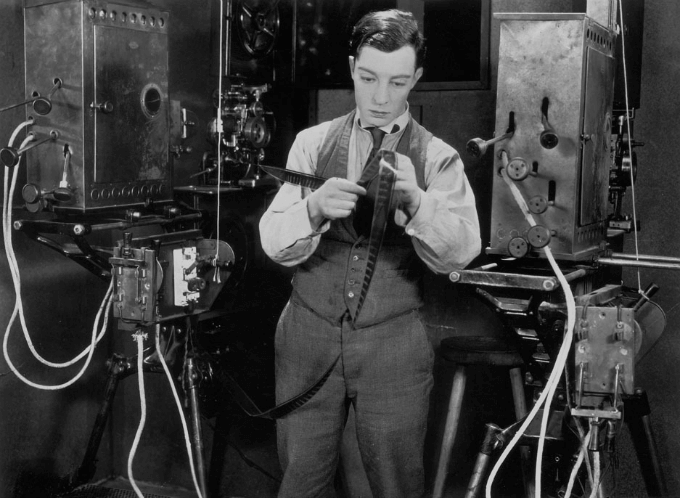 I decided we would watch Buster Keaton’s 1924 film, Sherlock, Jr.
And he loved it. He is no stranger to silent movies. Even though I limit screen time with my kids I love to show them silent movies. Since we threw out our television, we watch on the laptop. It’s the only time I envy all those families with big flat screens. 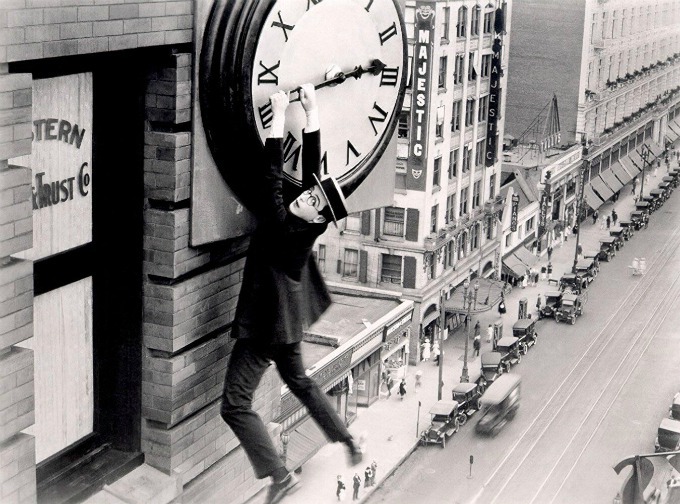 The first silent movie we saw together was Harold Lloyd’s Safety Last on the big screen. That’s when I realized that watching old silent comedy films with my kids was the bee’s knees. Why should a silent film be your next pick for family movie night? My kids love the physical slap-stick comedy of geniuses like Keaton, Chaplin and Lloyd. The relative lack of dialogue means that their attention is keyed up to the action–can’t look away or you will miss something! Without sound, they focus on the faces and emotions. Sure it’s over the top, but characters express fear, wonder, confusion, love with their whole bodies. Watching a silent movie is an immersive experience. It feels more theatrical than a contemporary film. Even if they don’t mention it, kids are also getting a lesson in how music informs the action in the film. In fact some of the same skills kids use in reading comprehension are the ones they are putting to good use when they watch a silent film. I find that the effects on my kids’ brains is not quite as severe after watching an old movie that engages their imagination and requires more effort to watch than, say, a Netflix kids’ show. However, to combat the after-tech tantrums, be sure to use this technique! A caveat. Sometimes these movies have behaviors that make you cringe. Gender stereotypes run rampant and too many of the films include racial stereotypes as well. Instead of staying quiet and hoping my kids don’t notice (they all do) I always use these as teachable moments and encourage you to do the same. You want to raise critical thinkers, right? Ignoring the offense only perpetuates the damage. Which Silent Movies to Watch? Even if you don’t want to commit to a full-length film, watching clips of famous movie scenes is fun, too. You can find tons of clips on YouTube. In addition, many old films are much shorter than today’s feature films. This might be my youngest son’s favorite. He can not get enough of it. When we saw it on the big screen we (along with everyone else in the movie theater) were audibly gasping! We’ve watched so many Buster Keaton movies I’m not picking a favorite! This is the one we most recently watched together. It’s also under an hour. This 20 minute film is hilarious! Even though we knew Laurel and Hardy were not actually going to plummet off the top of a construction site, all of us were holding our breath! You alternate between biting your nails, laughing and gasping in fear! It’s like a ride on a roller coaster! Exhilarating! This short film is an absolute must for any silent film watcher. Although your kids may appreciate the prat falls of Keaton more so than they recognize the genius innovation of Méliès, they will at least recognize the iconic image of a moon with a rocket in its eye. You may be surprised to hear we have yet to watch a full-length Charlie Chaplin movie. We have watched some clips, though, like the factory scene from Modern Times (1936). So there you have it, plenty of reasons to let your kids have a little extra screen time. Be sure to watch with your kids because you will enjoy it just as much as they will. If you need an educational reason to do so, think of it as a history lesson! My family loves Buster Keaton silent films! Our boys loved watching “The General” with Buster Keaton. We love watching silent films, too. Our top favorite is Charley Chase’s Mighty Like a Moose. It’s hilarious! Thanks for this list!